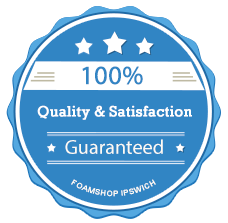 If you are looking to make minor repairs or wish to have a complete refurbishment made to the living area or horse area of your horsebox or trailer, then The Foam Shop is your answer to achieve the desired results you are looking for. From the driving seat to your mattress in the horse box they don’t need to be lumpy, hard or warn out. We can replace cushions and mattresses and offer mattress overlays to help with extra comfort. We can completely transform the interior design of your horse box, with new covers, blinds or curtains. The mattresses and cushions can be cut to most shapes and sizes so they fit your horsebox and finish the overall look off to the best it can be. The overlays come from the same range as what would be on your bed at home. We have the egg box overlay or memory foam options. So now we have you travelling in style and comfort, what about your horse? Partitions and support bars do not have to be, worn dangerous and unpadded. We have foams in stock often used to support and absorb pressure from your horse or pony to make their loading, unloading and travelling comfortable and safe. If you need new coverings for your partitions we recommend vinyls or PVC’s as they are easy to keep clean and hard wearing. We have a wide range of colours available in stock and you can see the range we have on the online catalogue. Taking your horse or pony out in your trap or cart, or using them in the showing ring, is a great past time and serious showing competition, but you do not have to be uncomfortable whilst you are doing this. Our range of seating foams can offer you comfort and with a range of fabrics and vinyls you can create a seat that fits with the period of your cart or the style you wish to achieve. We can make new bench seats and cushions, with period finishes such as piped edges and decorative upholstery nails to give you the ultimate class and perfection you deserve. Over the years we have supplied many stud farms with padding for covering and foaling rooms. We have specialist foam available which will ensures the weight and pressure from your horse is absorbed by the foam and can offer the protection you are looking for. We can also accommodate trade enquiries for these and for the best quotes please contact via telephone or email. For all your equestrian related foams and upholstery projects whether you would like to tackle them yourself or allow our team or experts to work on them for you, please contact us today with your sizes and requirements by clicking here.